My little Malachi is no longer so little. 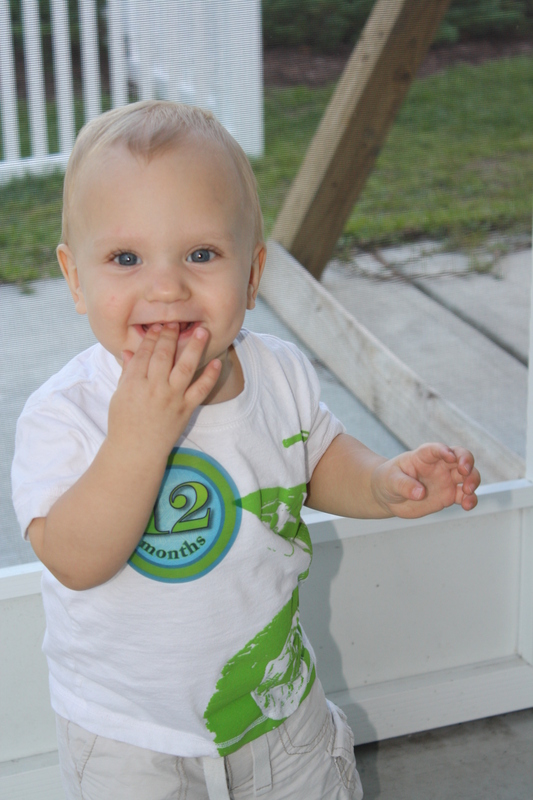 My baby is 15 months old (Jan 12)….exactly how did that happen? So much about my little boy has changed, and I couldn’t be prouder of each and every tiny accomplishment he’s made. 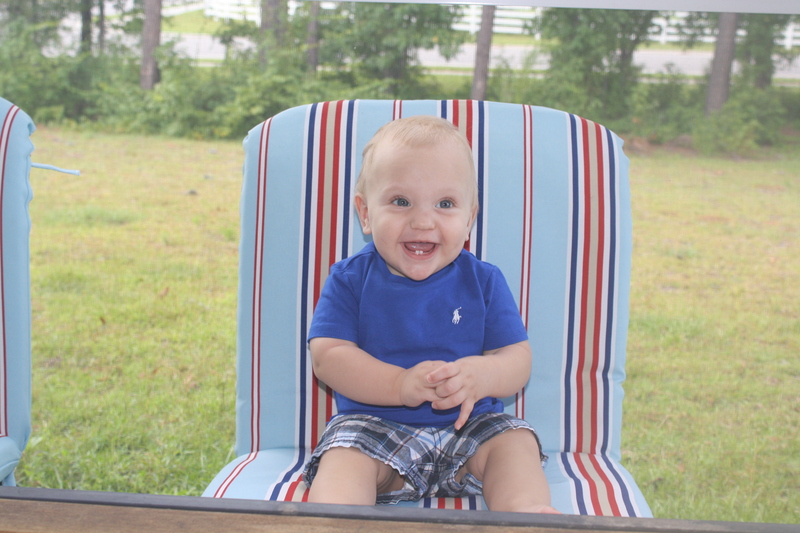 I have officially become one of those people I said I would never be….the kind of person who screams and giggles with excitement when my child learns to blow kisses, wave bye-bye, moves his stool to the bathtub, and eats all his food. Such small things, but oh how they blow me away. In the weeks since I lasted posted, my little man has given me so many beautiful memories to hide away in my heart. Malachi is our outdoorsman. 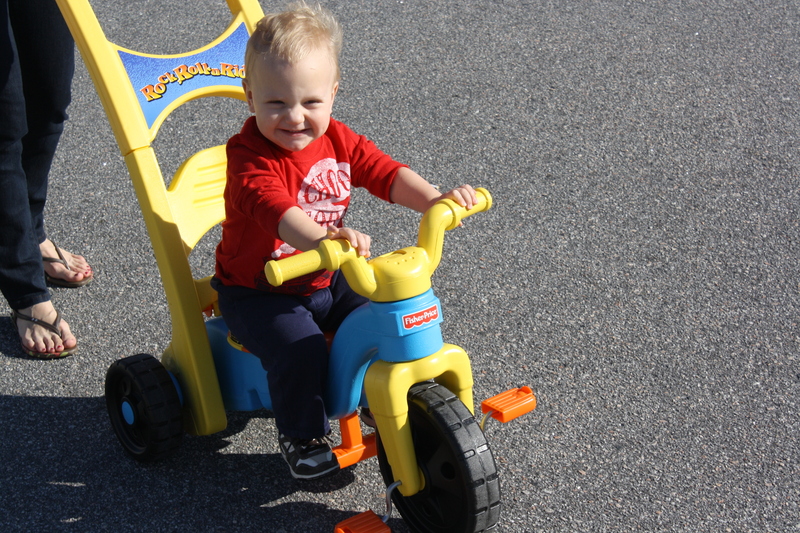 He LOVES walks, riding in his wagon or on his trike, playing in the yard, playing at the playground, and feeding the ducks. On a sunny day, he wants to be ousid (outside). Smart boy…though now I am on the hunt for a backpack of some kind to carry him in for hikes and things. Any suggestions out there? Malachi is also such a comedian. He loves to tease us, play games with us and laugh. 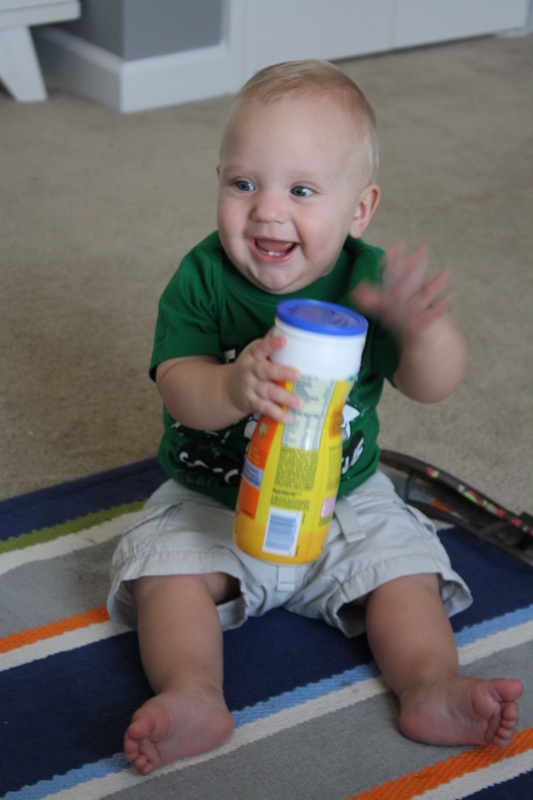 His new favorite games are: In and Out (he takes all the toys out of his baskets and puts them all back in), Where’s ___? 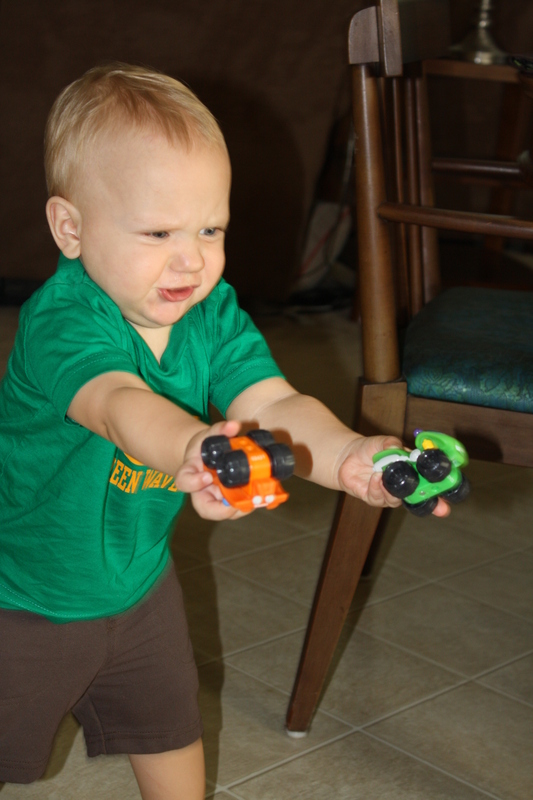 (He likes to hunt for us), Wipe (wipes our noses, this comes from me trying to make a game about wiping his nose since he has had a 3 week cold), Choo Choo (rides the train up and down our legs), Go Go Go (tag), and Where’s Your____? (he can find his eyes, nose, mouth, tongue, teeth and belly). Malachi is 26 lbs and 10 oz (75th percentile). 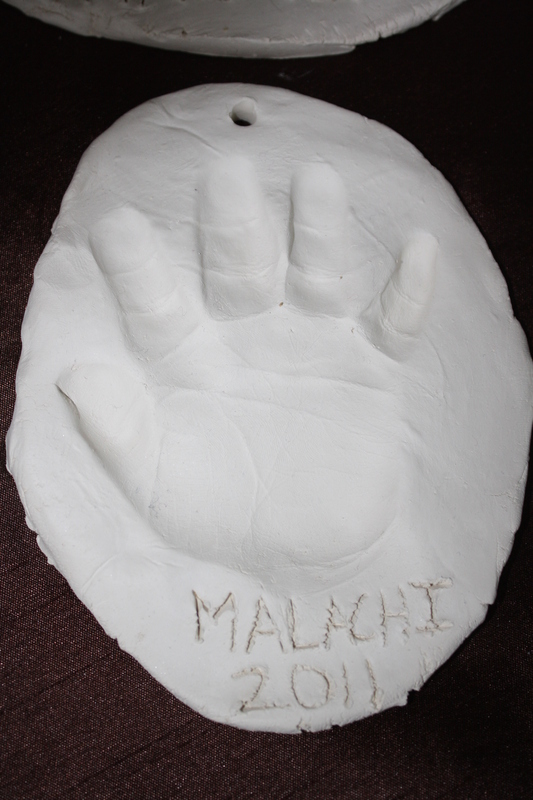 Malachi is 33 and 1/4 inches tall (95th percentile). Malachi is in size 4 diapers. 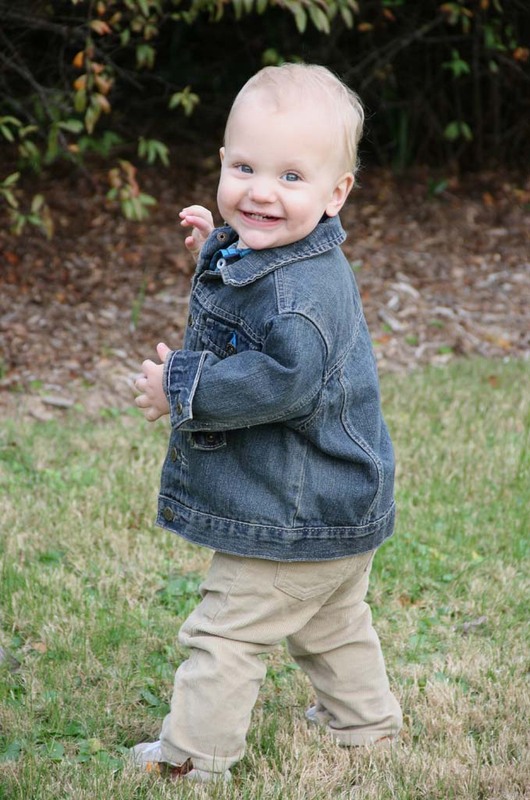 Malachi wears size 18 month clothes, but he’s about to need 24 month tops. He wears 2T-4T socks for his BIG feet. He wears size 6.5W shoes. As we are entering this new and crazy stage of Malachi’s life, I anticipate some amazing and challenging moments, but I am sure that I am going to love EACH ONE! Happy 15 months Precious One! I, so distinctly, remember waking up around 4:30 a.m. on the morning of October 12, 2010 and feeling such a mix of emotions…everything from absolute fear to complete awe. In the following hours, I began really preparing my heart and mind for whatever would happen when Malachi was born. I had been told a few weeks prior that Malachi could potentially be facing dwarfism because the measurements they took on the ultrasounds were weeks off the curve. 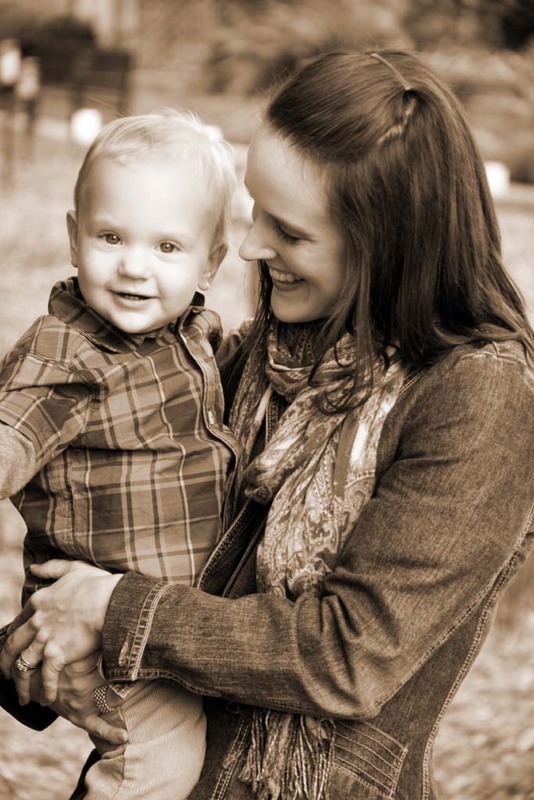 I wanted to be ready to simply embrace my son for whoever the Lord had designed him to be. And then the moment came to push. After 1 hour of pushing, my precious son, Charles Malachi Weber, had arrived!! 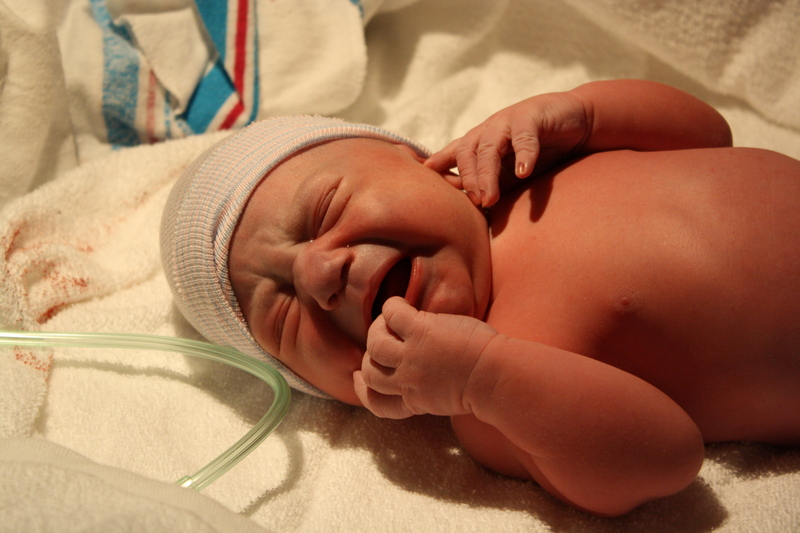 At 2:26 p.m., my 8 lb 10.8 oz and 19 3/4 inch son changed my world with his COMPLETELY PERFECT body. My God had worked a HUGE miracle. 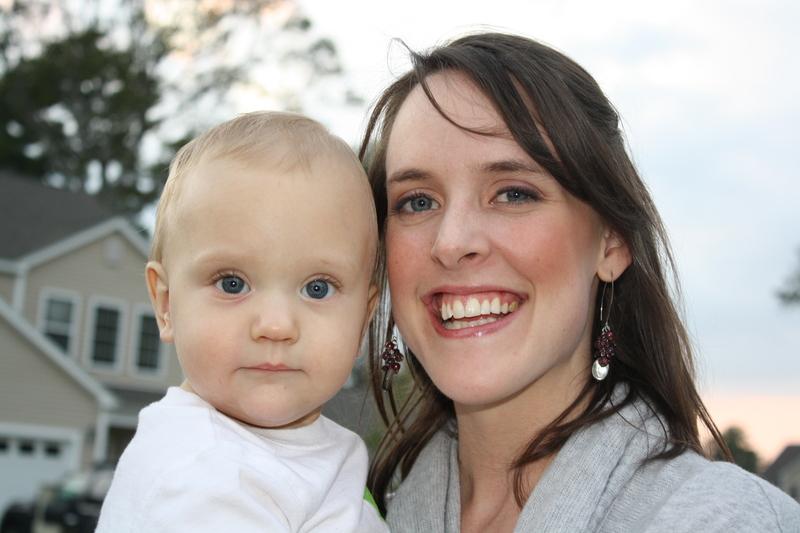 Over the last year, my little miracle has brought me such joy and challenged me in ways I never thought possible. 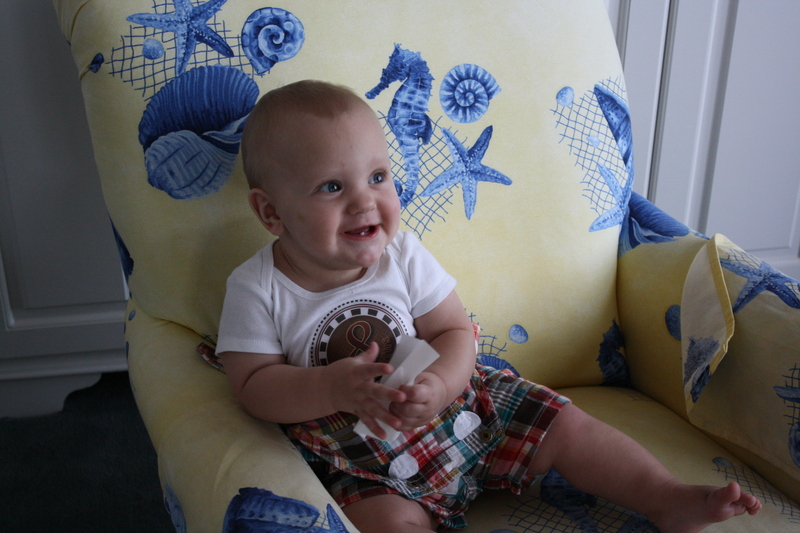 He is such a beautiful, fun, happy, and smart boy! 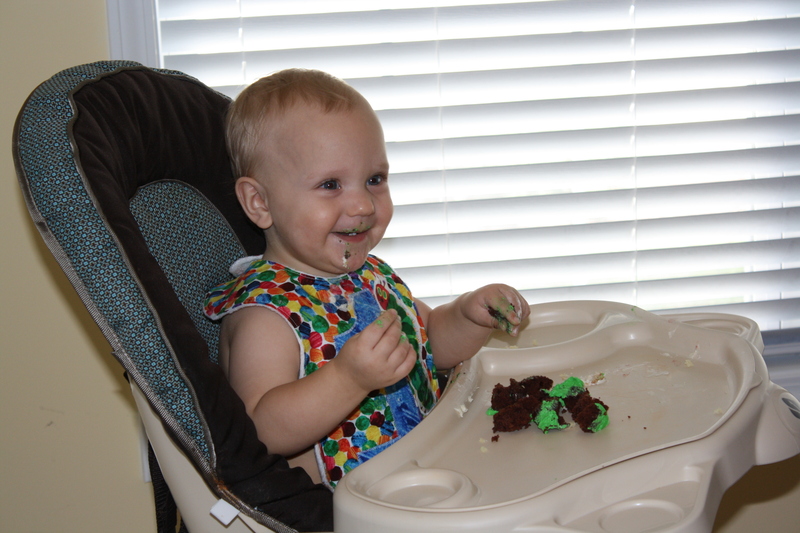 We so enjoyed celebrating a year of his life with our family and friends in a Very Hungry Caterpillar birthday party! We took a ton of pictures and you can check them out on Facebook. Here’s a quick glimpse! In his 12th month of life, he has learned so much! We are in awe of this crazy gift we’ve been given and have had the best time with him. 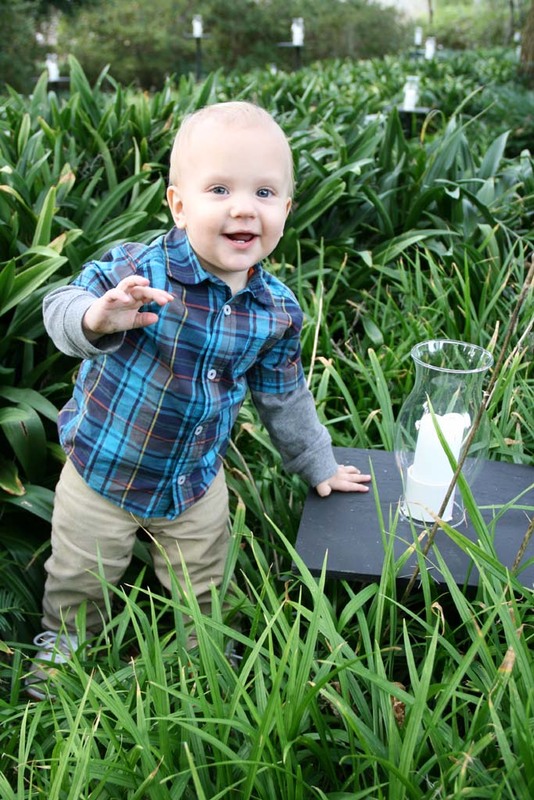 In reminiscing over the last year, it breaks my heart that my baby is now a toddler….however, I wouldn’t change this new stage of life for anything. ~He knows and understands the meaning of a lot of words now. If we say bath, he walks to his bathroom. If we say outside, he walks to the patio door. If we say eat, he walks to his high chair. If we say milk, he walks to the kitchen. If we say night-night, he walks to his bedroom. ~He loves reading and will come up to one of us and say “buk” (book) so that we will read to him. He really enjoys the touch and feel books and turning all the pages. He has even started babbling as though he is reading the book himself. ~He now initiates lots of play with us: peek-a-boo, “go-go-go” (tag), stacking and then destroying blocks, passing the ball back and forth, high-fives. ~We’ve also been working with him on some basic obedience. 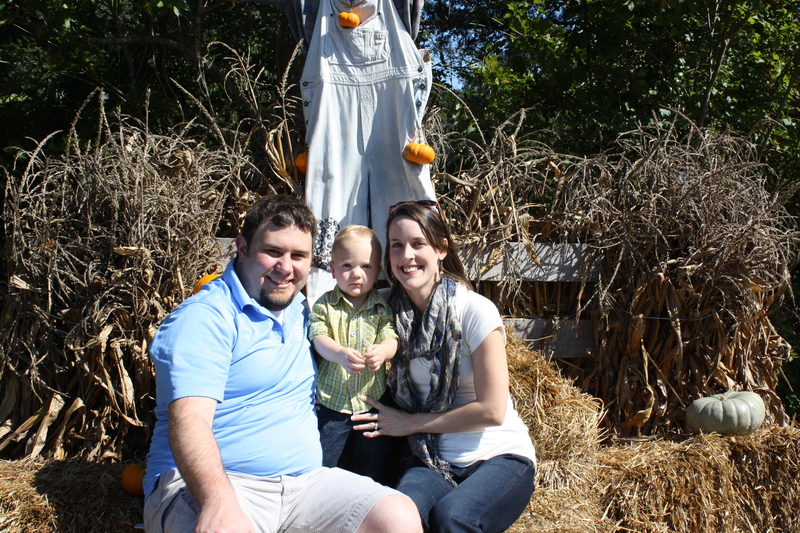 Our son is VERY strong-willed and stubborn, so we’re are trying to start early. We’ve been pretty fortunate that when we say “No” to him, that he understands and stops. 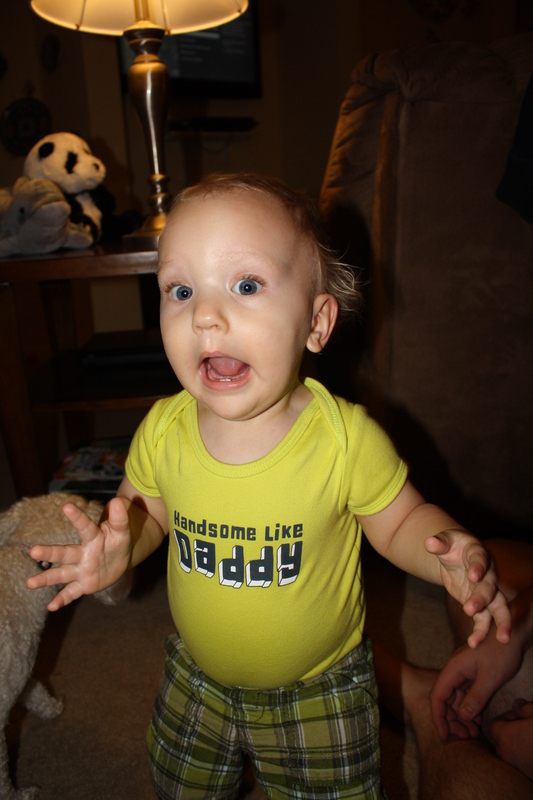 He also responds really well to praise and just loves it when we gush all over him…haha. 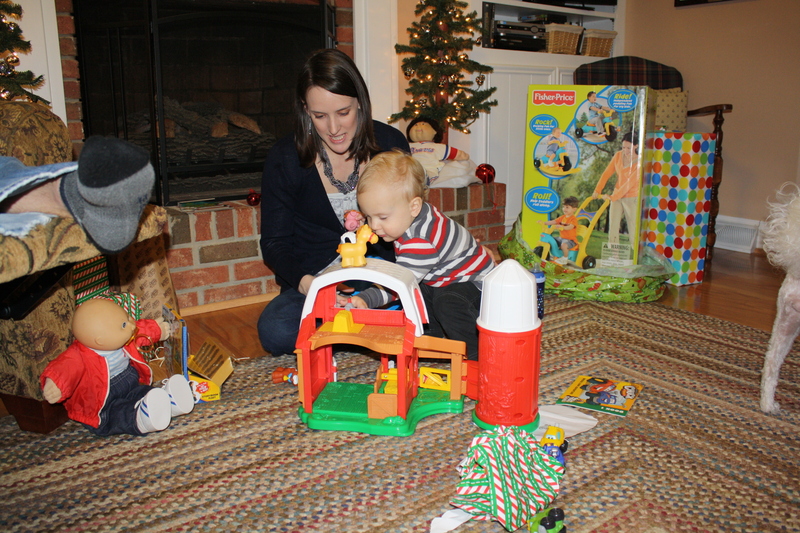 We’re hopeful that we will be able to avoid a lot of tantrums by starting early….fingers crossed. ~Malachi is now predominantly in 18 month clothes. ~Malachi is wearing size 2T-4T socks and size 6W shoes for his BIG feet! ~Malachi is wearing size 4 diapers. ~Malachi is on about 1/4 whole milk and 3/4 formula. We are slowing weaning him off the formula and giving him more milk each day. So far so good! 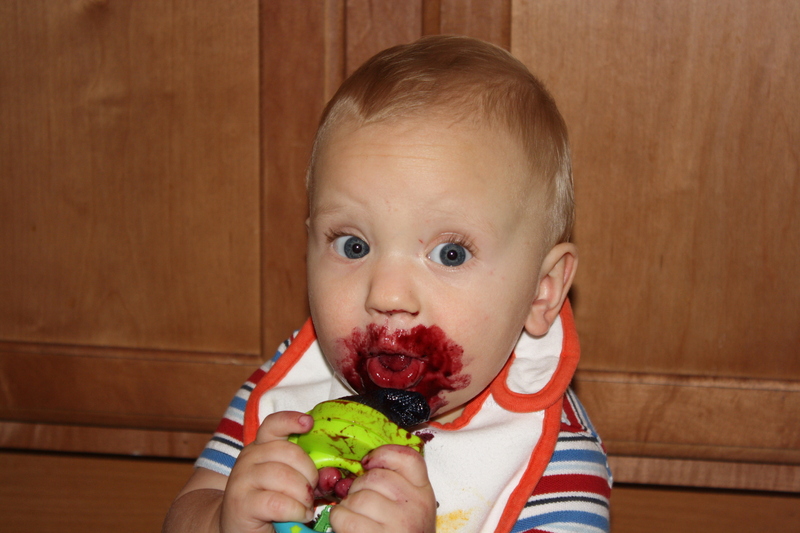 ~Malachi is eating all kinds of foods these days. We let him try whatever Hal and I are eating and he seems to respond well to most of it. 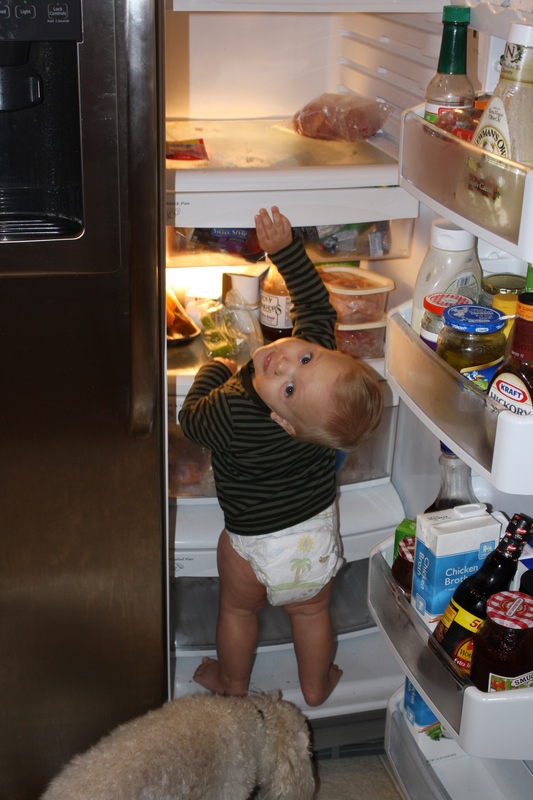 While he definitely has some favorite foods, I am so thankful that he doesn’t seem to be too picky yet. Precious boy, I am so thankful for your life. 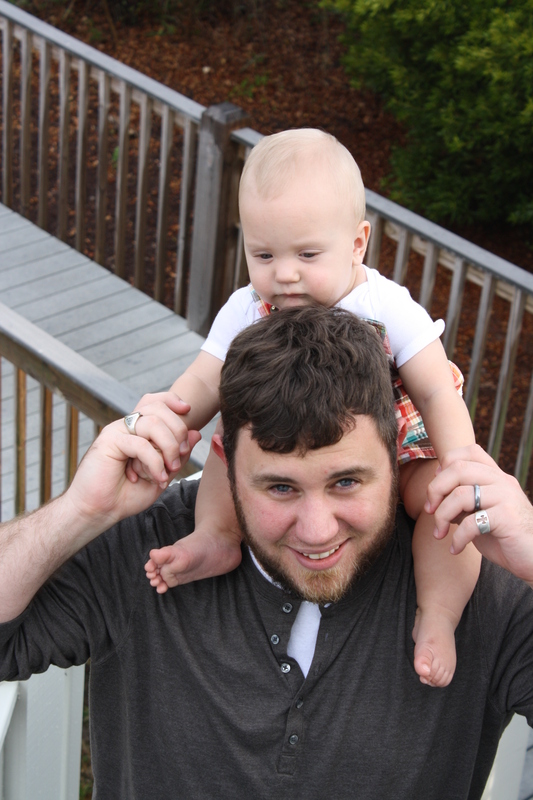 Your Daddy and I have enjoyed each day throughout this first year of your life. 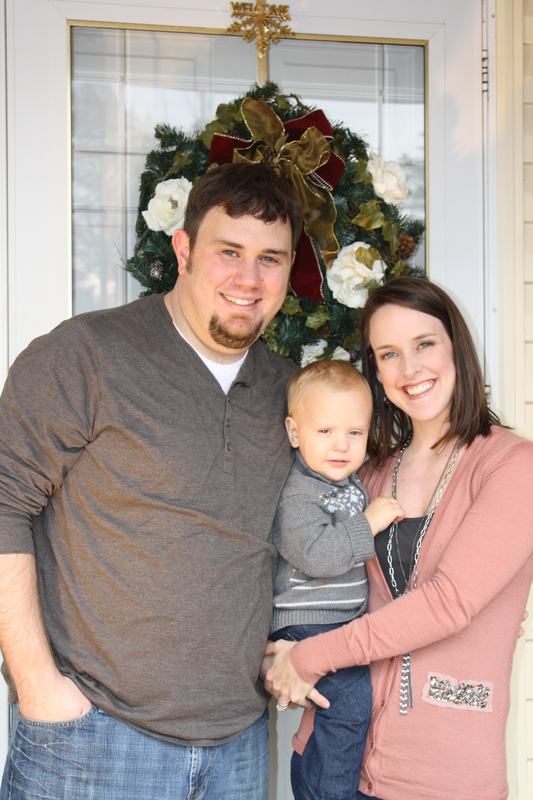 You enrich our lives and make us strive to be the best parents we can be to our best boy! I love you, I love you, I love you…ever and always! 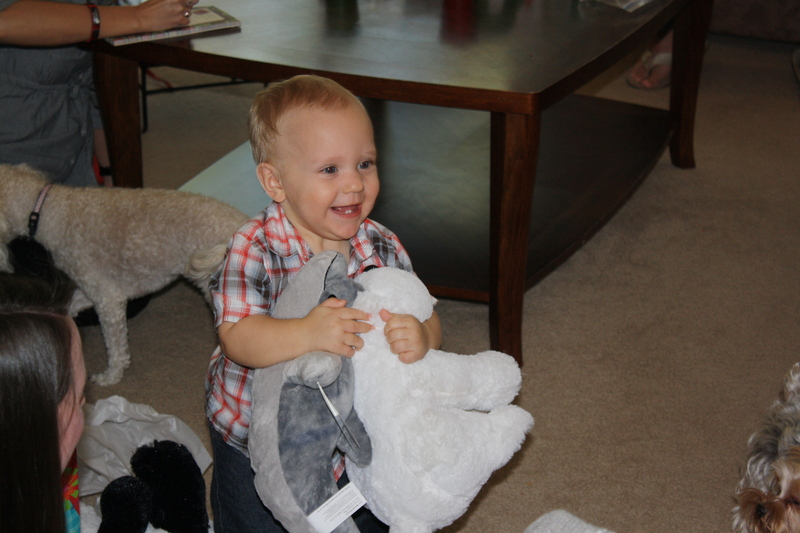 Happy first birthday, Malachi! 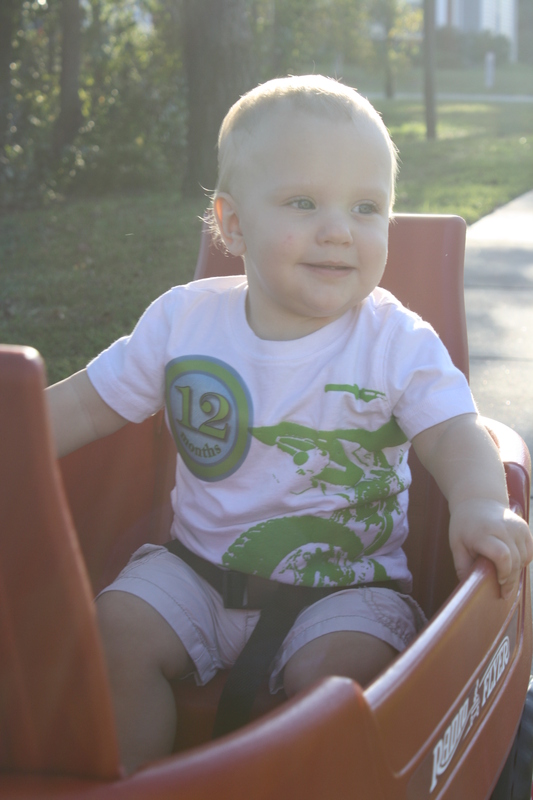 Malachi is 11 months (Sept 12)!! 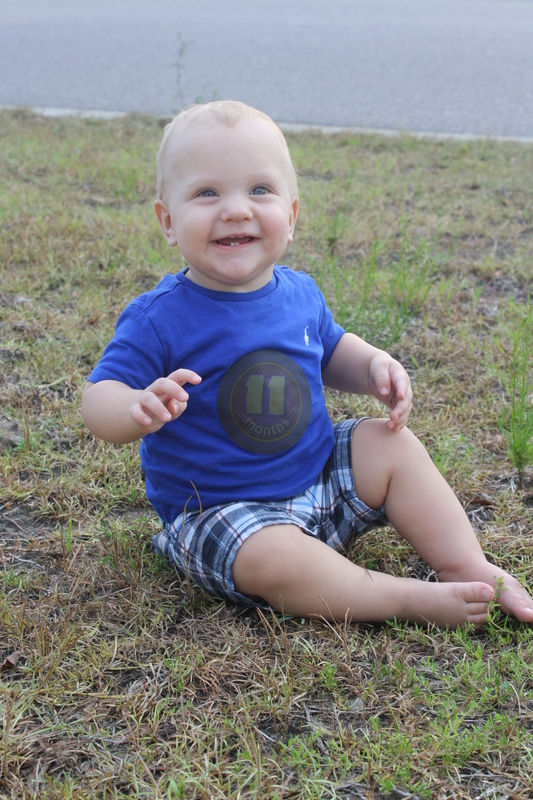 My baby is 11 months old…and 5 days! 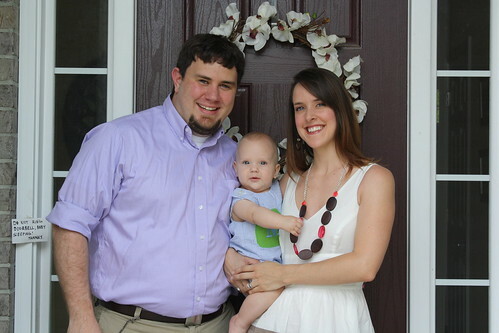 Plans for Malachi’s first birthday party are in full swing….how is it possible that I almost have a 1 year old?! We decided to do a Very Hungry Caterpillar party since Malachi LOVES that book. Hal made the sweetest invitations, I’ve planned decor and food, ordered Malachi a Hungry Caterpillar bib for his special day, bought his outfit, mailed the invitations and the countdown has begun. Man, oh, man, we have had so much fun with Chi this last month. We have started to see glimpses into the kind of boy he’s going to be, and LORD HAVE MERCY, we are going to have our hands full! Malachi is a super busy boy! 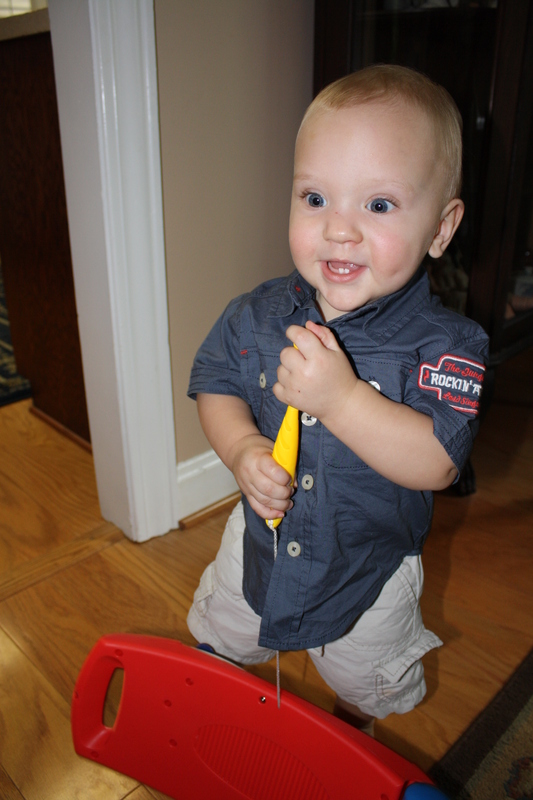 He is into everything..kitchen cabinets, the pantry, the fridge, is closets, his toy bins, my shoe basket…you name it! He LOVES to take things out and put them back in, he likes figuring out how things work, and he is so curious about the world. With this increase in personality and independence, a very strong will has come out. He is stubborn and, boy, does he have a temper! Hal and I can tell that he is going to test us and keep us on our toes! On the other hand, he is so sweet. He loves to give hugs and likes to hold our faces close to his. He giggles and laughs and has the most beautiful smile. All this to say, our boy has grown up on us! We’ve had several more firsts! 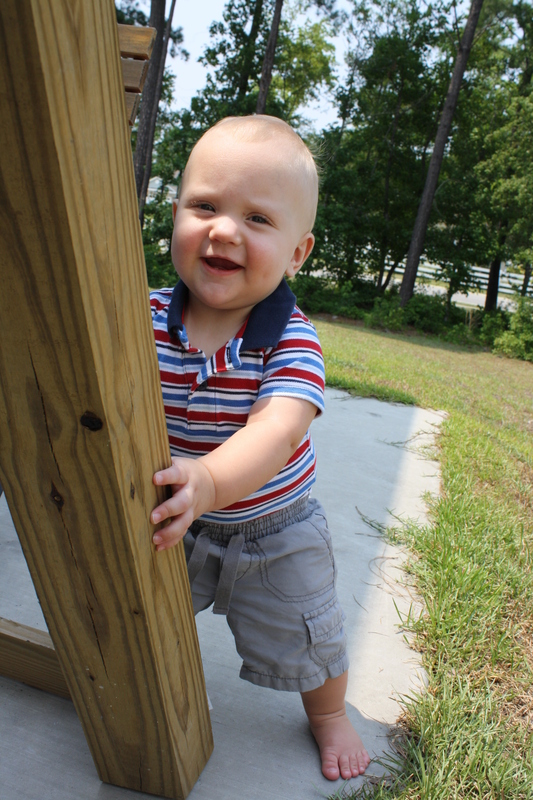 ~On July 27, Malachi took his first steps! (He was 9.5 months) We were so fortunate to catch them on video! 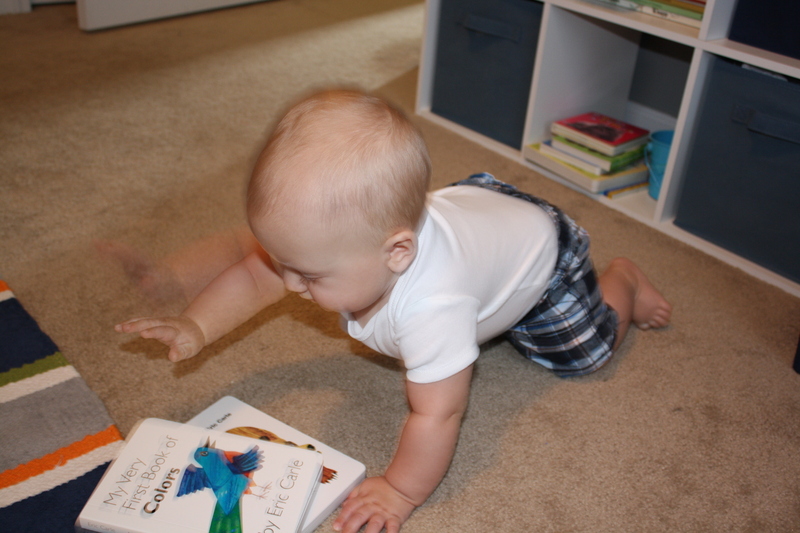 Much like he did with crawling, once he started walking he refused to crawl again. As you can imagine, Malachi runs all over this house. ~He loves to be barefoot and does not like putting on shoes. We’ve started making him wear them some in the house so that he can get used to them. Because of his big feet, we have had to buy size 5 shoes!!! Can you believe it? ~Malachi now has 6 teeth, 4 on top and 2 on the bottom. He has four more coming in. 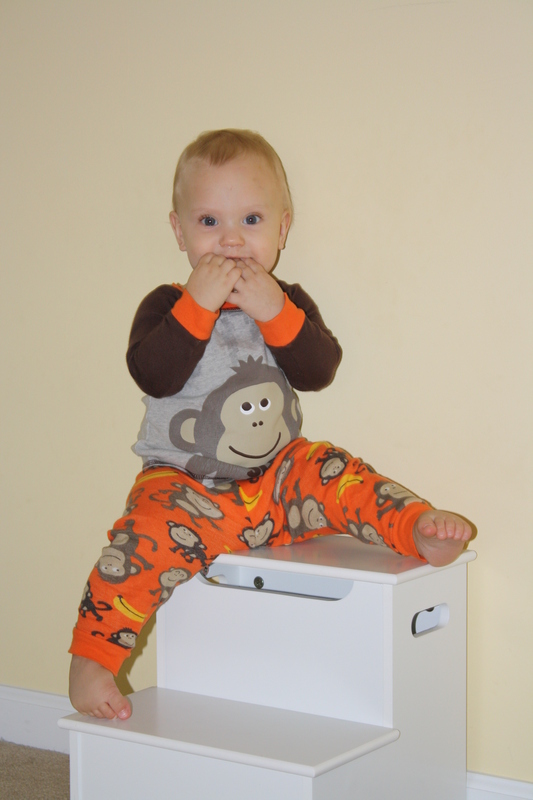 ~Malachi is a climber! 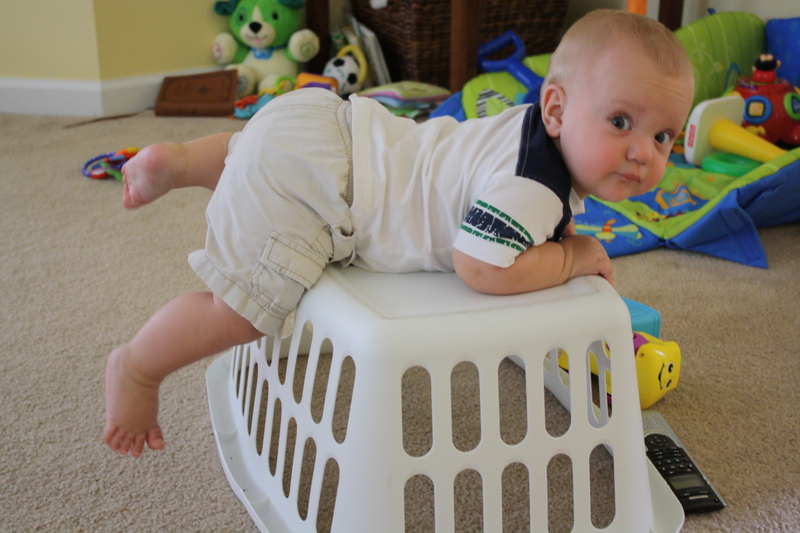 He climbs on everything…end tables, baskets, toys. He can now pull himself onto our couch. As Hal says, there is nowhere safe. 🙂 And he would be right. ~Malachi has started responding to games we play. He knows how to high-5 and how to play tag (around the couch). ~He copycats everything we say. We’re learning to be very careful what we say in front of him. ~He has been our little foodie. We pretty much give him a few bites of whatever we are eating to try. The only thing that he does not like is broccoli. He HATES broccoli. His favorite foods are bananas, ravioli, spaghetti, chicken and rice, and peas. ~Malachi’s height is unknown, but I swear I think he’s grown an inch or two! 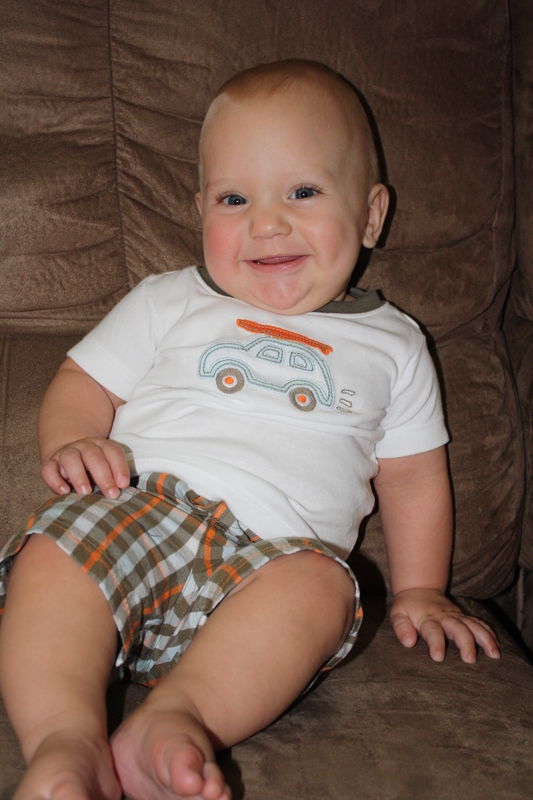 ~Malachi is in 12/18 month clothes, though he is already growing out of 12 months. I’m looking forward to the day when I can buy clothes that will fit him for longer than 3 months. ~Malachi still gets about 25-30 oz. of formula a day. We plan on introducing him to whole milk soon. ~Malachi is eating all kinds of foods these days. He eats three meals a day, with a few snacks thrown in. He always eats oatmeal for breakfast with some kind of fruit thrown in. For lunch and dinner he mostly eats veggies with some protein in addition. He always gets to try a little bit of whatever I am making for lunch or dinner. So, tonight he will get to try beef stew! Malachi, you are such a fantastic kid. You make each day both a challenge and a joy. I find such pleasure in watching you learn and explore and discover who you are and the world around you. I love being your mom and am so proud you are my son. Happy 11 months, baby! Whew! Having a mobile child is exhausting! Particularly when this child is most content when he is cruising through the entire house and getting into all the things that he shouldn’t be. 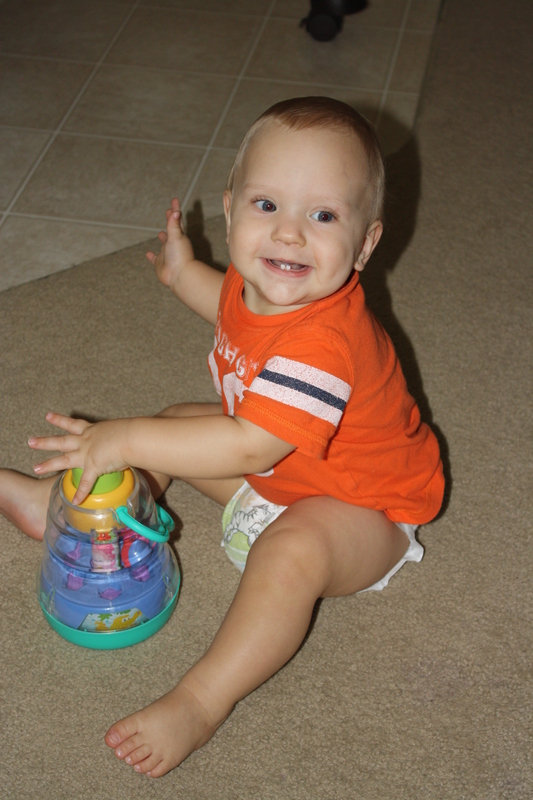 He certainly keeps my toes, and with each additional month it becomes more obvious that my little boy is closer to being a toddler than my baby. While my heart breaks a little every day, I am so blessed to watch him grow and learn and explore. 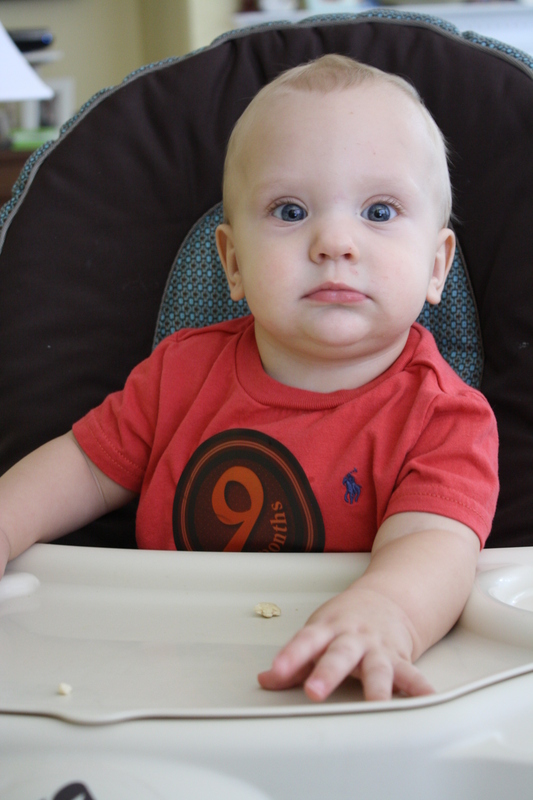 On July 12, Malachi turned 9 months old. And with that milestone, a few more firsts! ~Malachi cut two more teeth! 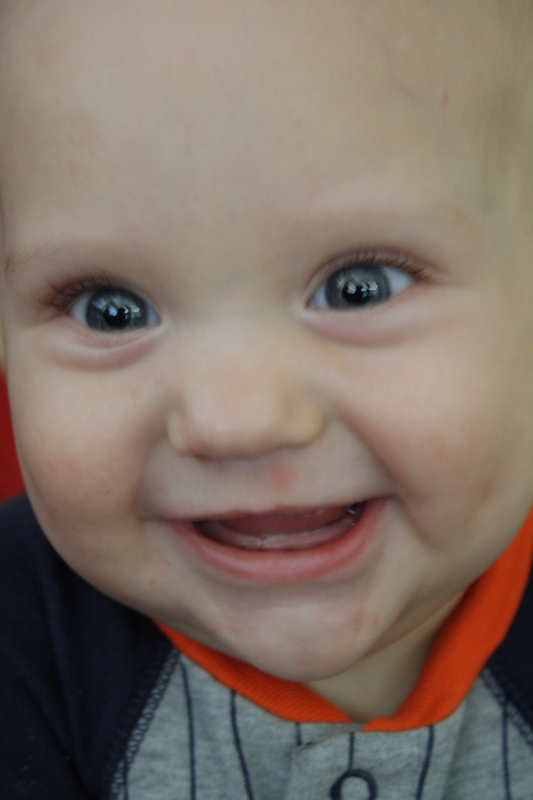 He now has two very cute bottom teeth and one top tooth. He’s still drooling like a faucet and his other top tooth should cut through any day now! ~Malachi is now eating Puffs, grapes, pieces of bread and elbow pasta! It seems with the addition of the other teeth he finally gained the confidence to try the table food again. The first couple times were a disaster of Chi choking and me fishing out half-dissolved Puff-mush from his mouth. YUCK! I love that he is now able to start feeding himself some snacks..AND that he loves them! 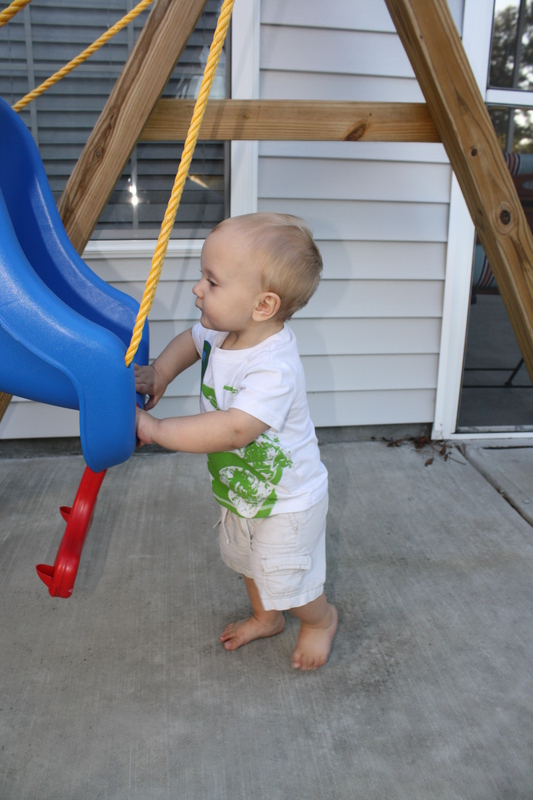 ~Malachi is still working pretty hard at standing without having to hold on to anything. 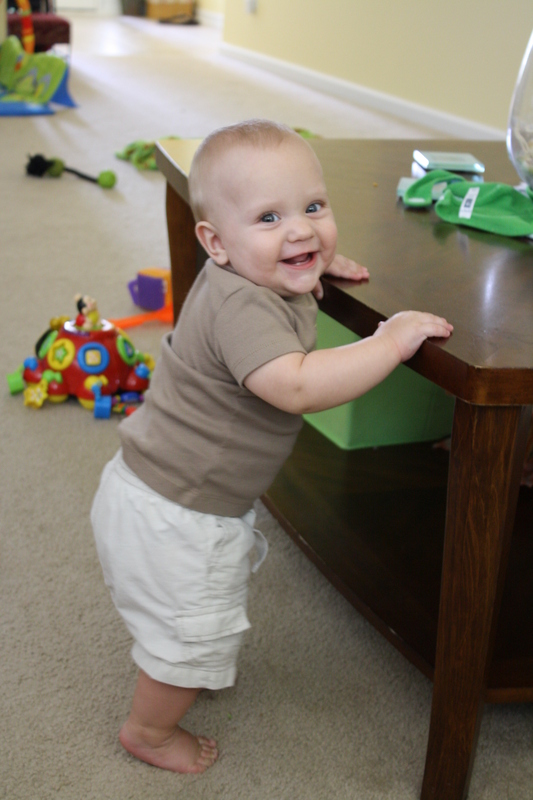 He can stand for 5-10 seconds all by himself before he starts dancing or gets bored and loses his balance. ~Malachi and I now have a new game. I walk in front of him while he holds on to my legs and walks behind me…a human version of a walker. 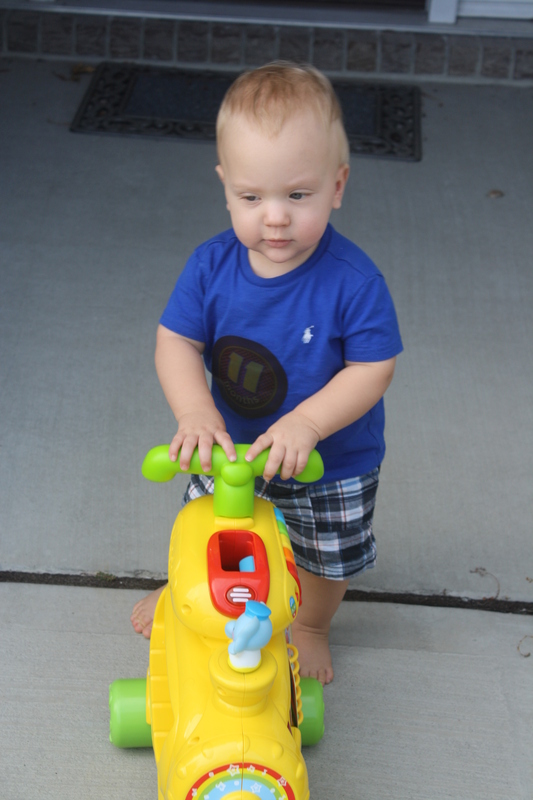 🙂 We got him a toy that transitions from walker to rider and he LOVES being able to walk around on his own…though sometimes the walker gets away from him and he falls (he’s not a fan of that). ~Malachi LOVES to dance. Any time music comes on, his hips start shaking, his head starts bopping and his smile is a mile wide! ~Malachi now is able to address me as Mama and Hal as Dada about 75% of the time correctly. He loves to mimic the noises we make and laughs and laughs whenever we mimic him. ~You weigh 24 pounds (90th percentile)! ~You’re 30 inches tall (90th percentile)! ~ You are now wearing size 4 diapers! ~ You are officially in 12-18 month clothes. You’re my little chunker! ~You are wearing size 4 sandals for those BIG feet, but you’re barefoot most of the time. ~ You are on all formula bottles. You do drink about 2-4 oz. of water a day as well (in lieu of juice). ~You’re eating oatmeal, rice, bananas, avocados, sweet potatoes, apples, pears, plums, peaches, blueberries, russet potatoes, green beans, peas, broccoli, carrots, acorn squash, butternut squash, zucchini, watermelon, cantaloupe, cucumbers, summer squash, cauliflower, spinach, and chicken. ~You’ve started eating some table food: Gerber Puffs, grapes, bread and elbow pasta. 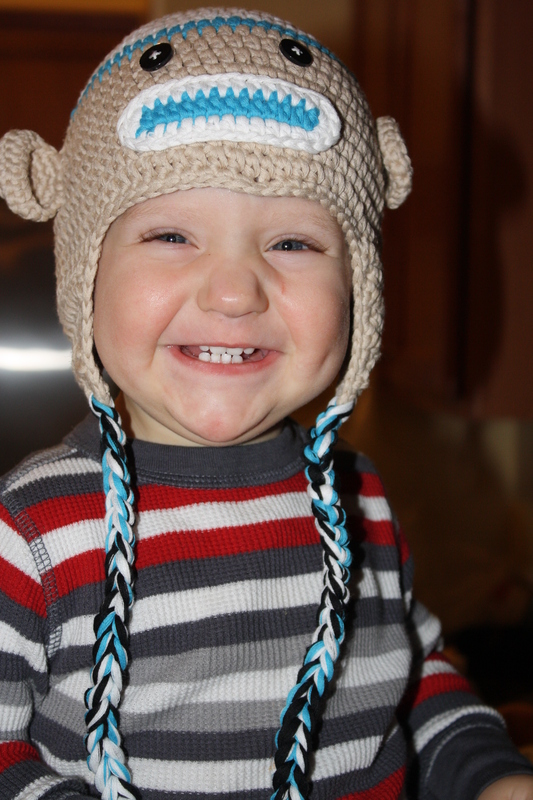 Malachi, you are the light of my life! I love watching you explore your world and learn each day. I love that you are reaching for me for hugs and to be picked up. I love that you love kisses and snuggles from your Mama. I love that sunny smile I see when I come get you from your crib. I love that you enjoy playing with your puppy. You’re so much fun, sweet boy! 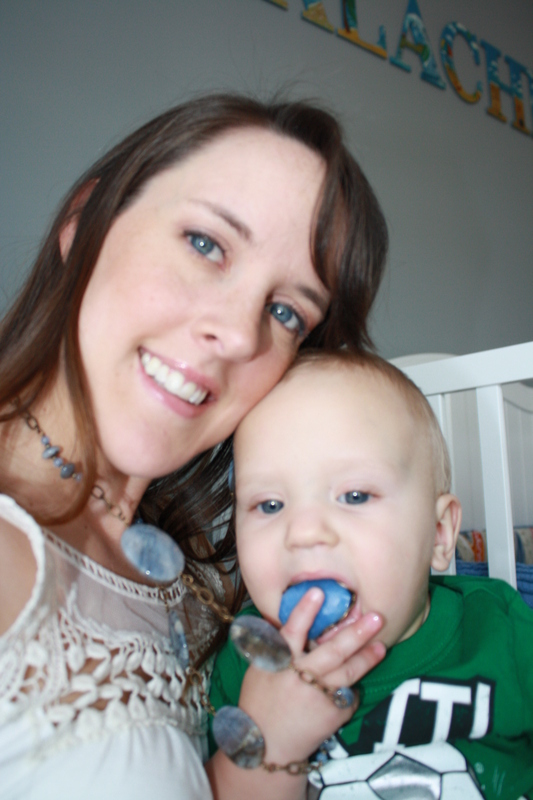 Like all new Mommies, I had a lot of ideas of things I wanted to do once my son was born. 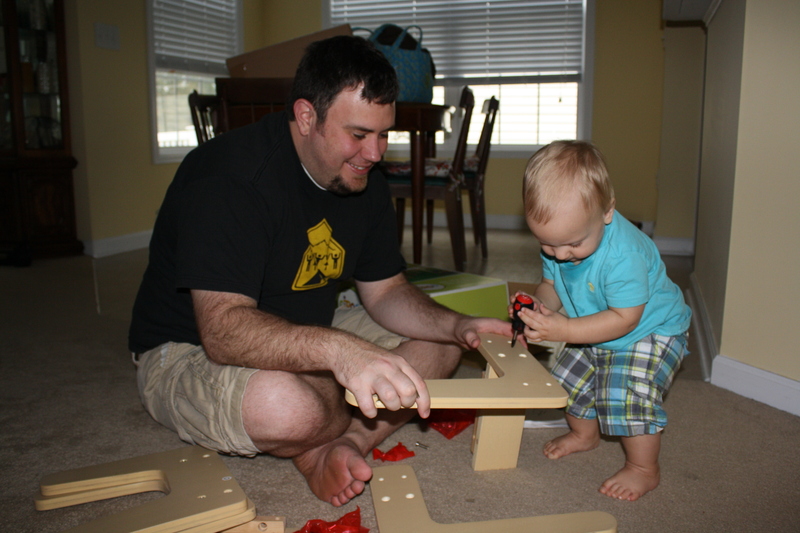 And I quickly learned that I needed to amend my ideas to suit my son and our new lifestyle. 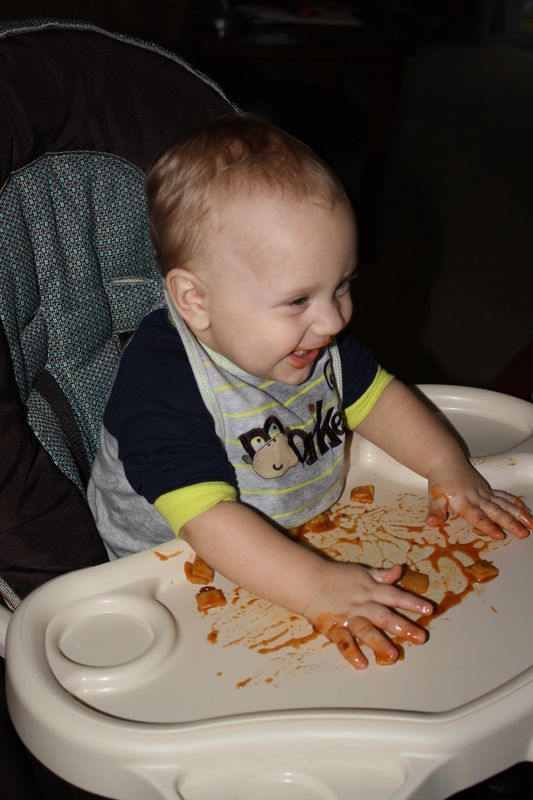 However, making my son’s baby food is one of those items on the list that stayed. I had several reasons for choosing to do this: I wanted to know what was in his food, I wanted to use organics as much as possible, and I wanted to save money! I’ve also found it to be fun. I’ve recently had some requests on how I make Chi’s food and what he’s eating, so the rest of the post will have all that! The beauty of making your own baby food is that you can buy fruits and vegetables in bulk and make enough food to last several weeks. For example, I just purchased the following gala apples, peaches, pears, sweet potatoes and cantaloupe ($15). This dollar amount will get you about 20-30 jars of baby food (depending on where you buy them and what brands). For $15, I now have approximately 70 “jars” of baby food. 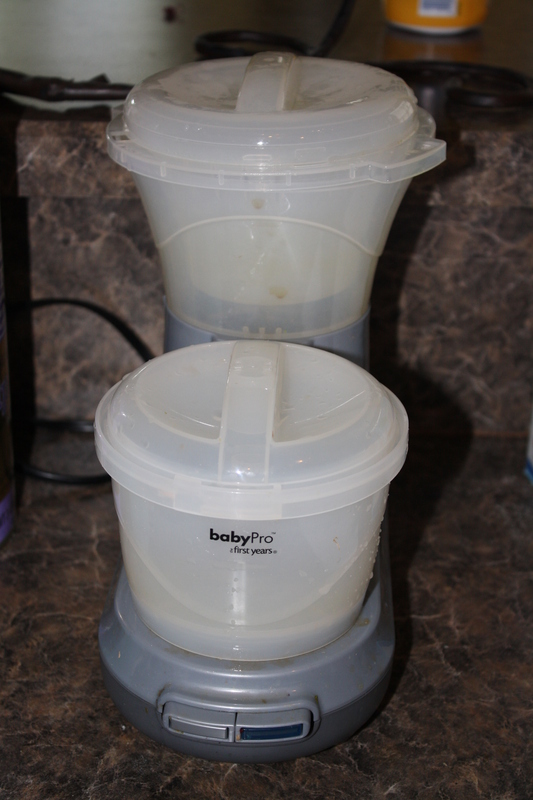 I purchased the First Years Baby Pro food processor (with steamer and puree attachments). This is great for any food that doesn’t have a tough skin. For food with skins (like peas and green beans), I use the baby food/puree option on my Oster blender. I also purchased 6 ice cube trays (I found mine in the dollar bin at Target) and Press and Seal wrap. The ice cubes are approximately 1 ounce. The Process: I prefer steaming all of Malachi’s fruits and veggies because the good nutrients are maintained versus cooking on the stove. If I can’t steam something, I’ll use the microwave (for potatoes, sweet potatoes, acorn squash and butternut squash). 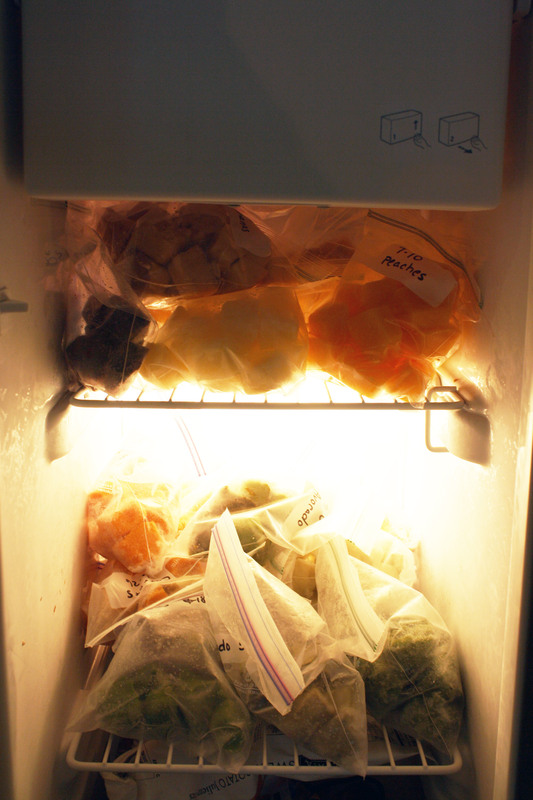 Once the puree is poured into the ice cube trays and frozen, remove cubes and place into FREEZER bags with the date and the type of food. For most other vegetables: chop into small pieces, steam 8-12 minutes (until soft), puree, pour into ice cube trays and freeze. ***Note: I added a bit of formula or breast milk to the purees to thin them out when Malachi was younger until the puree was at the consistency I desired. ***Generally, it is important to introduce a single new food for four consecutive days. This will allow you to note if there are any allergic or adverse reactions. Nine Months: (I’ll be adding Cantaloupe, Cauliflower, Spinach, and Chicken this month). ***A great resource for a daily feeding schedule can be found at http://www.wholesomebabyfood.com. I use this as a general guideline, but feed Malachi more or less as he demands. As it stands now, Malachi gets three solid food meals a day plus an extra fruit and snacks. 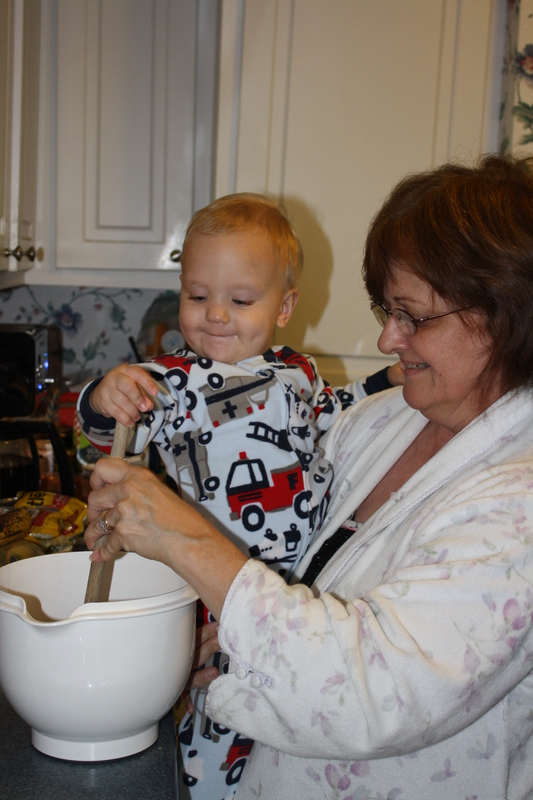 ***A great recipe book for baby and toddler food is The Best Homemade Baby Food on the Planet by Karen Knight. This book provides month-by-month recipes, new food introductions by month, tips and allergy information. This month has been one of MANY firsts…these firsts have made it abundantly clear that my baby is closer to being a toddler than a baby. It has been fantastic to watch Malachi learn each day. Sometimes I feel as though I can see the wheels in his brain turning. I have found myself becoming somewhat melancholy as I realize how quickly time has passed. Whenever he discovers something new or reaches a new milestone, I shed a tear of joy and sadness. 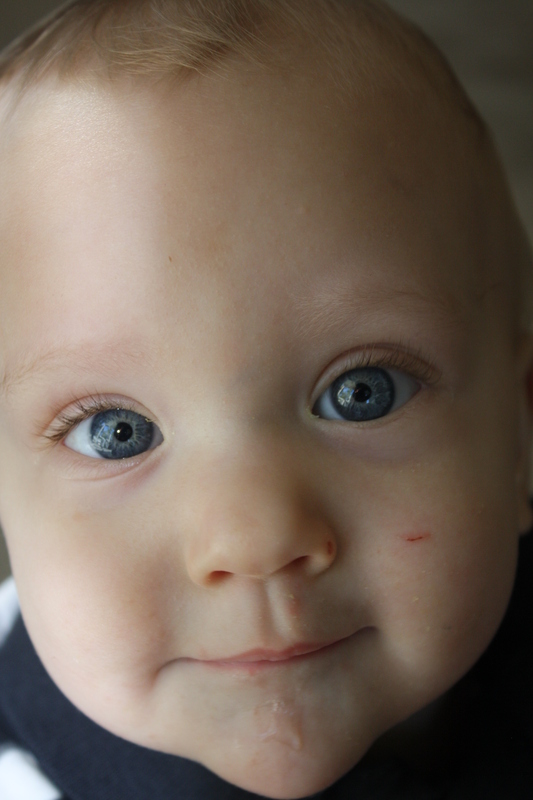 My little boy is growing up…faster than I ever expected. 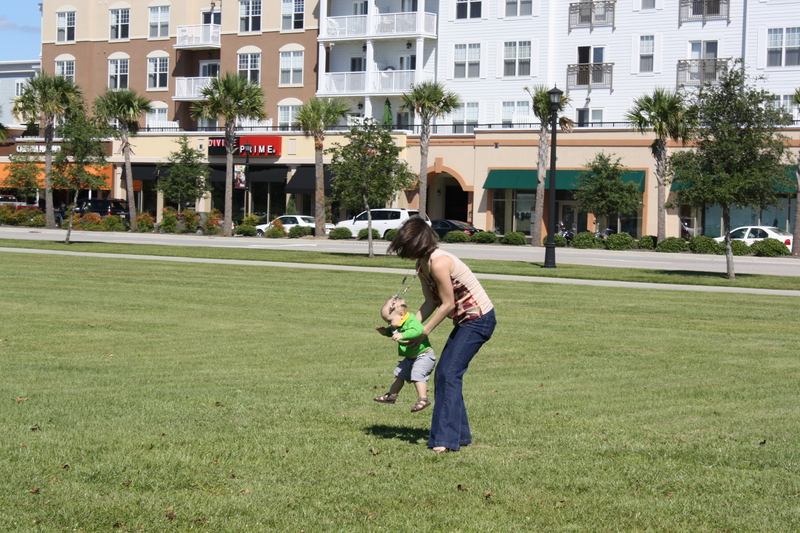 Other mommies told me to embrace every moment because it would fly by….and boy, has it! 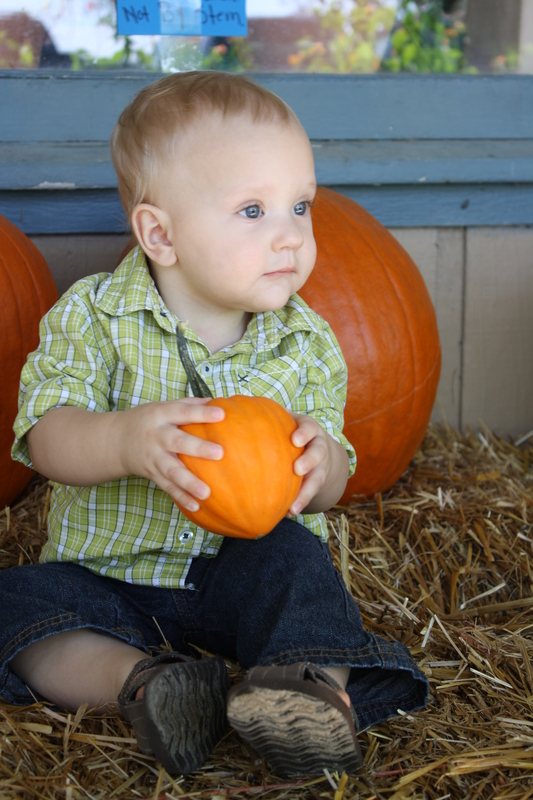 This month, (since June 12) I am really making it a priority to slow down and just enjoy my son. 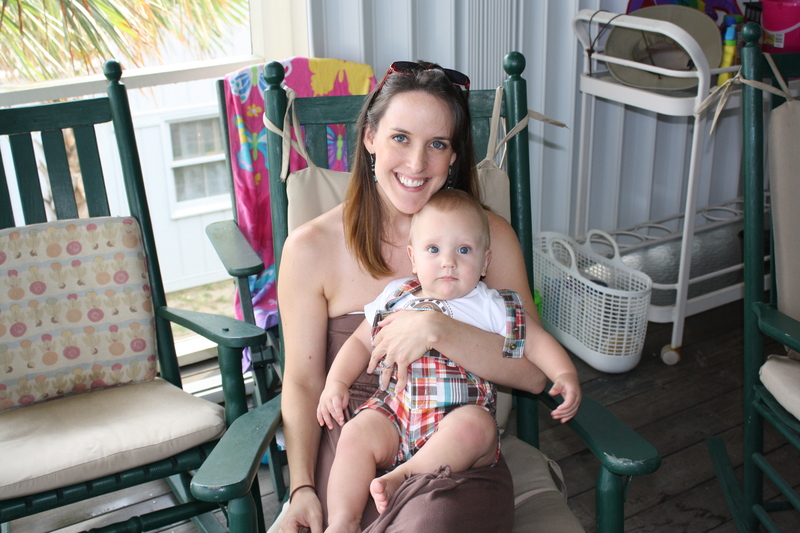 Hanging out at the Litchfield beach house with all the Webers. Malachi, you have been up to a lot lately! ~The big FIRST is that you started crawling. You were army crawling one day, ugly crawling the next day, and then full on crawling the next. 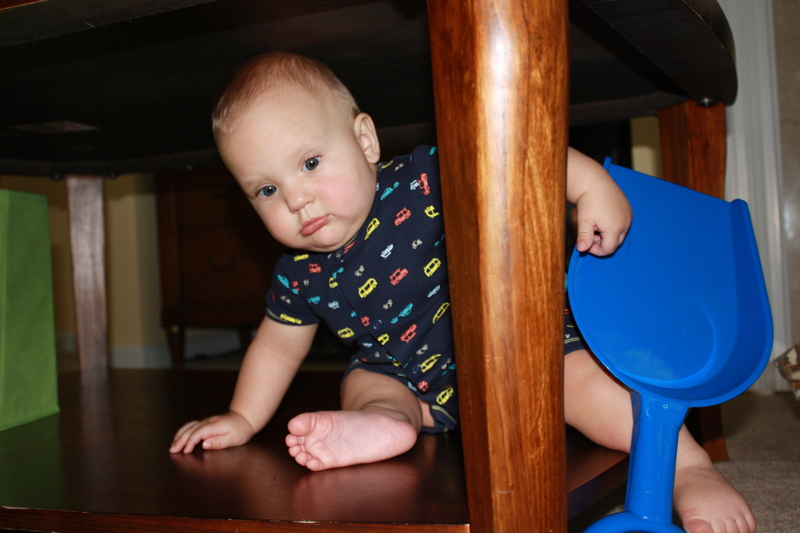 You started crawling a few days after your 7 month birthday. Now that you are mobile you are into everything…and I mean everything. You really like that you can have your own little adventures and enjoy your independence. Mommy appreciates that you are helping her to stay thin! ~Your next FIRST is that you are able to stand on your own for several seconds. The only reason you fall down is because you want to get to the next thing. We’ve had to really baby proof the house since you can reach everything on our tables. 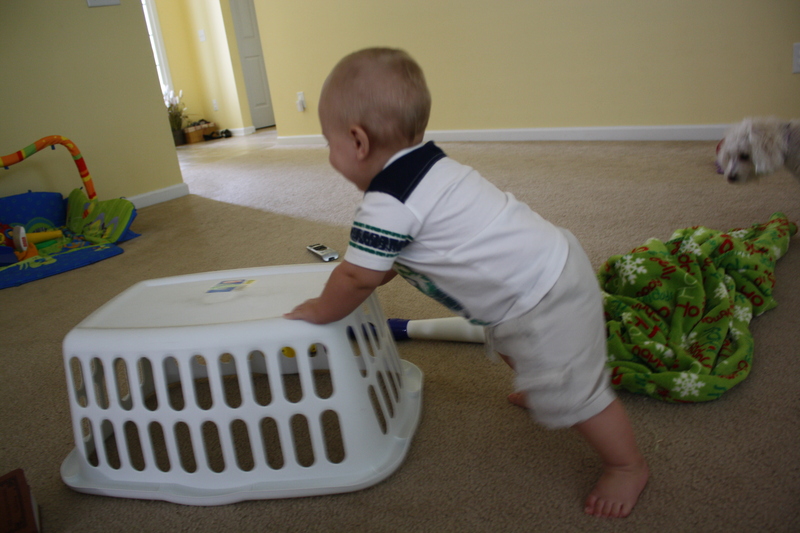 ~You’ve started walking by using the laundry basket as a walker. You like to walk all around the room and get angry when you run into something or Mommy puts the laundry basket away. I don’t think it will be long until you’re walking…Lord, have mercy. ~You are now able to soothe yourself to sleep at nap times. This has been a wonderful first in Mommy’s world! ~You are a champion eater and Mommy’s little foodie! You like everything you’ve tried thus far. Mommy is starting to get more creative by blending some of your food together. So far you’ve had: oatmeal, rice, avocados, apples, pears, peaches, blueberries, watermelon, bananas, peas, green beans, sweet potatoes, potatoes, butternut squash, acorn squash, broccoli, carrots, and zucchini. ~It looks, and feels, like you are going to cut three teeth soon (two top, one bottom). Your gums are swollen and you’re drooling more and more. ~You are still our water baby and love when we go to the beach and pool. ~ You are officially in 12 month clothes. You’re my little chunker! 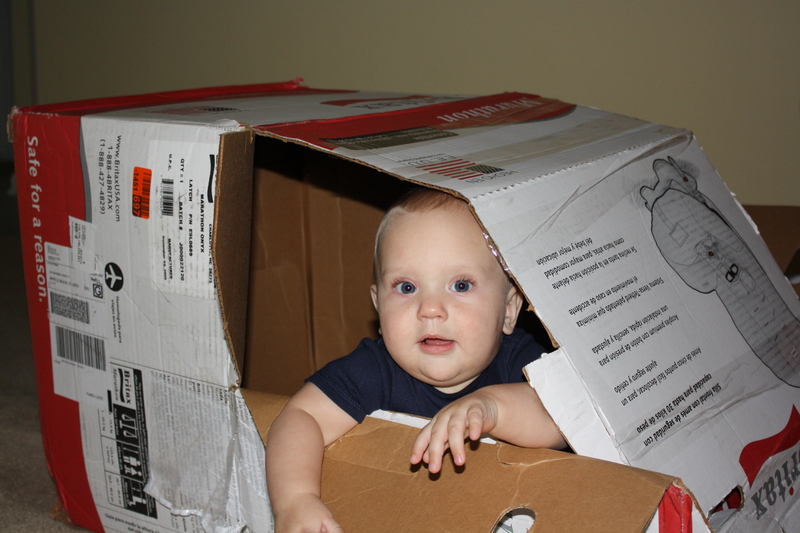 ~Because you have grown so much we had to buy you a new carseat. Your infant seat was way too small and you were miserable. 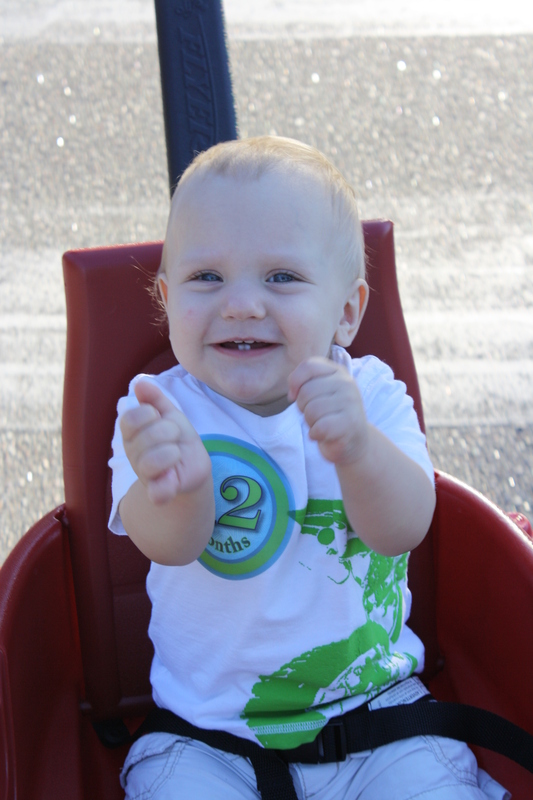 You are so much happier with all your space in the convertible car seat. Malachi, you are funny and engaging and busy and seemingly tireless and happy and crazy and bring your Mommy and Daddy such pleasure each day. I cannot wait to see what you’re going to be up to next! I love you baby! 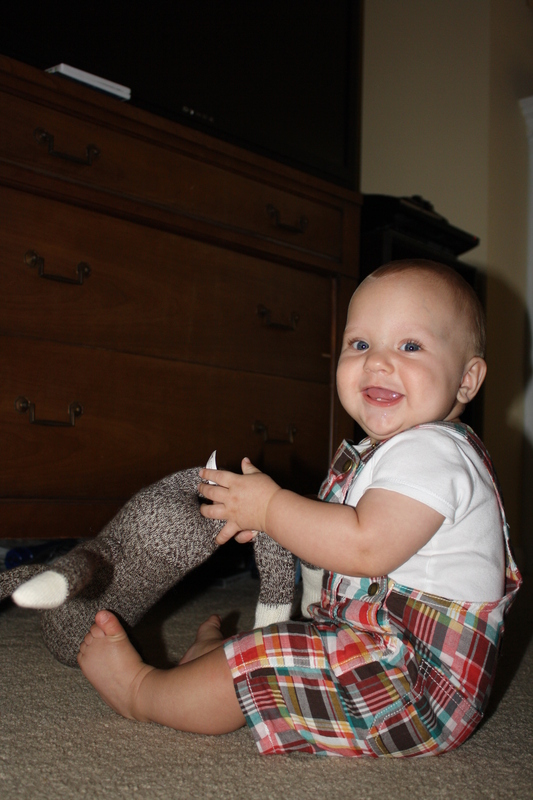 How is it possible that my little boy is already 7 months old? I ask myself on the daily basis this very question….after waiting so long for him, I just cannot believe how quickly the time has gone since his birth. He’s no longer this tiny, well he was never tiny, totally dependent baby. He’s a very sturdy, stubborn, pseudo-independent, wanna-be toddler. 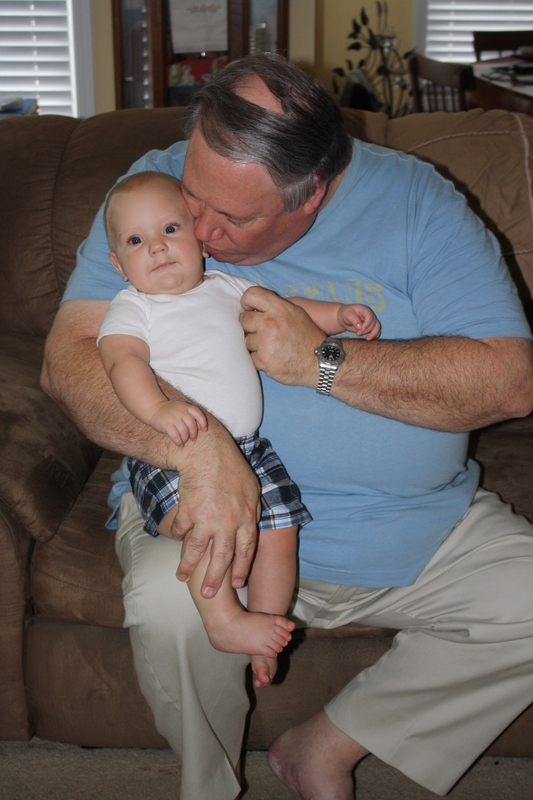 Malachi, you are such a joy to Daddy and me. You are so much fun and watching you develop and grow has been such a wonderful privilege for us to be a part of. It slowly breaks my heart to see you fighting so hard for independence, but I know this is a part of growing up…though I will always resent it. Just this month alone you have changed so much and learned new tricks! Precious boy, I love you! Happy 7 months birthday (May 12). You’ve been up to a lot lately! ~You are crawling….I cannot believe it! Now, you’re EVERYWHERE and into EVERYTHING! 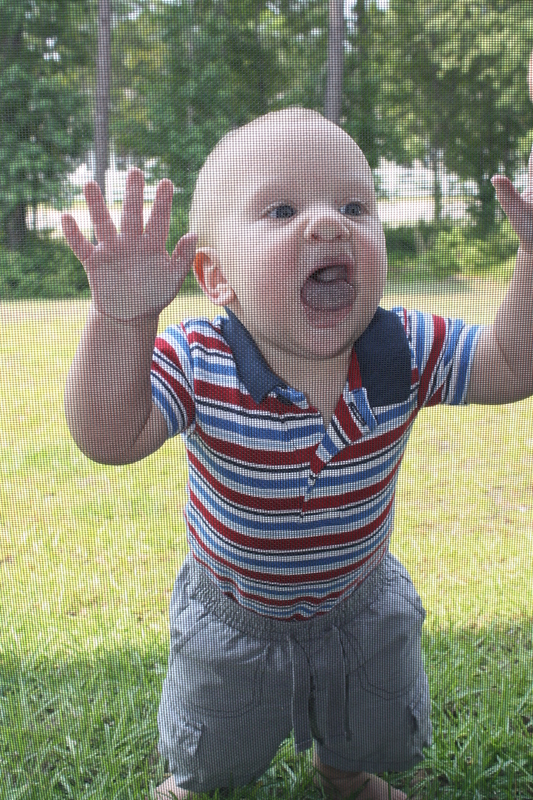 This is the best picture I could get of your crawling, but I do have you in action on video! ~You FINALLY cut your first tooth. 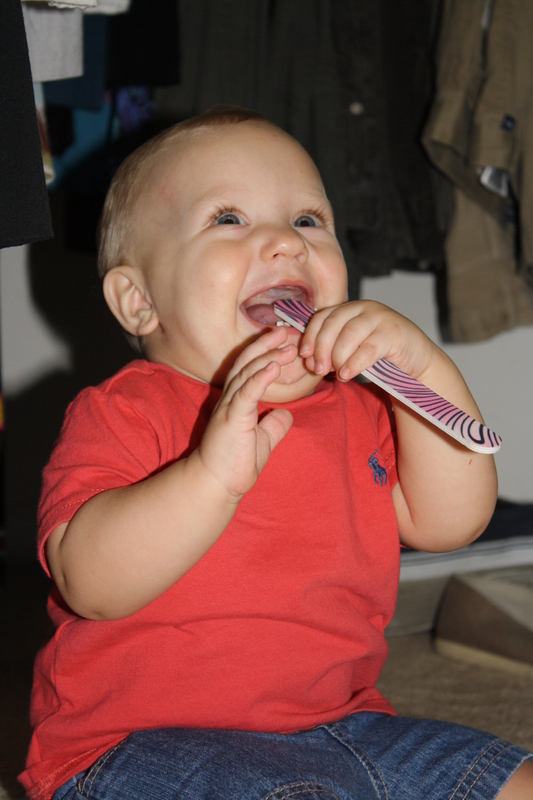 I’m already sort of missing your gummy grin…that tooth means you’re growing up and I haven’t decided if I like it yet. ~You’ve started pulling up on everything and have the bruises to prove it. 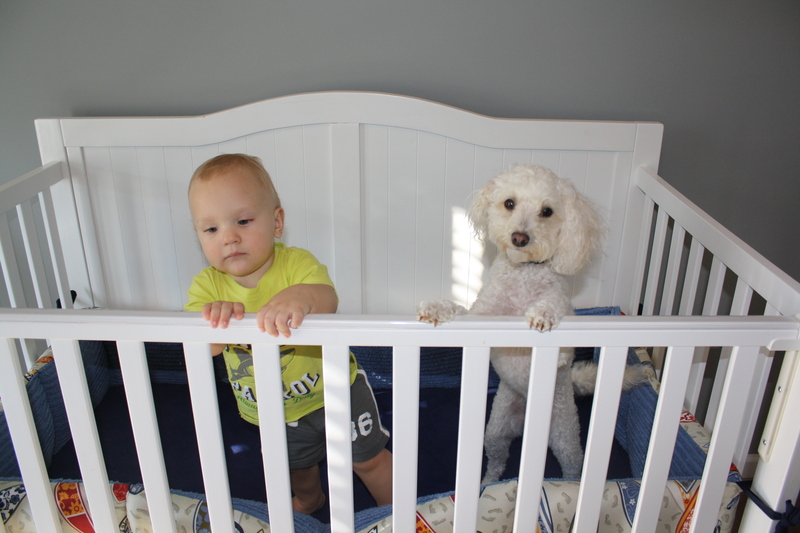 Daddy even had to lower the crib TWICE so you wouldn’t keep trying to kamakaze over the edge. ~You are a total water baby…you love the pool and the beach. 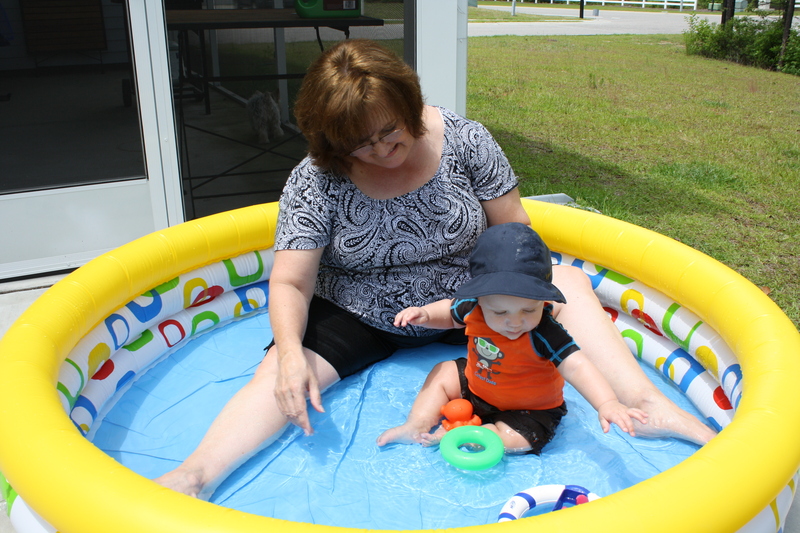 Mommy and Daddy just got you a baby pool so you can splash around at the house and you love it! ~You really like checking out what is going on around you. You’re interested in everything. I think that’s why you like our walks so much. ~You are a BUSY BOY! Now that you are mobile you are easily bored so we have to switch out your toys and give you new scenery to look at or you are not a happy camper. ~You are very strong-willed and Mommy and Daddy have had to start disciplining you when you insist on playing in Charlotte’s food and water bowls or chewing on the computer cords. You don’t like it, but you’re learning the word NO and that is a good thing. ~We think you may be left-handed, so it will be interesting to see if that holds true. ~You outgrew your baby tub, so you are now slipping and sliding and splashing in the “big boy” tub. You love all the extra space to play with your turtles…except when they get out of reach, that’s a little problematic. ~Your Bella and Papa came to stay with you while Mommy and Daddy went to Savannah for their 5 year wedding anniversary…you had the best time! ~ You are now wearing all kinds of clothing sizes. You wear predominantly 9 month onesies, 9 month sleepers (as long as there are no feet), and 12 month shorts. 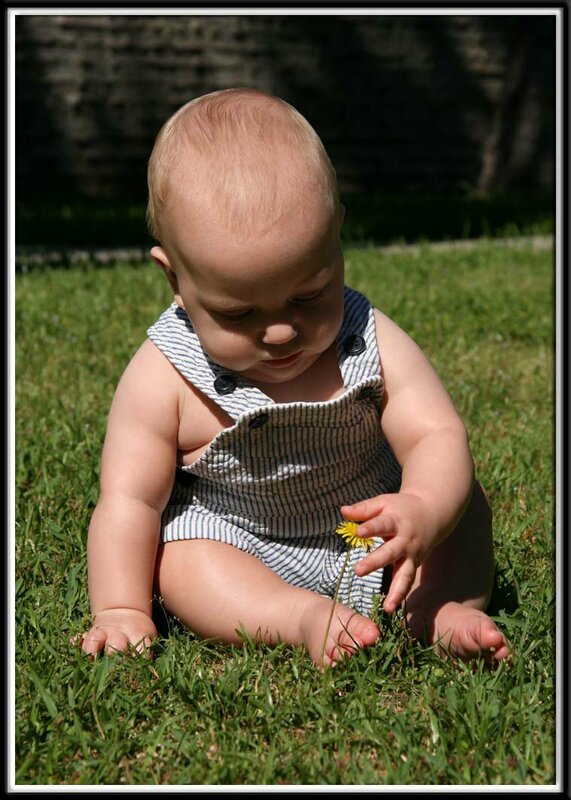 ~You are wearing size 9-12 month (size 4) sandals for those BIG feet, but you’re barefoot most of the time. ~You’re eating oatmeal, rice cereal, apples, pears, bananas, sweet potatoes, green beans, peas, butternut squash, and avocados. I’ll probably try you out on carrots, peaches, zucchini and potatoes soon. Your favorite foods are sweet potatoes, bananas and apples. (I am picking up on a theme of a sweet tooth). Sweet boy, you are such a fantastic challenge. Parenting has been the hardest job I have ever had, but you make it so worth the energy and effort. Each day I pray that the Lord would grow you into a sweet, strong boy that loves Him so much…and each day I see you blossoming, growing and becoming this prayer. Mommy and Daddy love you, Malachi! I am the wife to the most amazing man, Hal. I am the mother to my precious son, Malachi. I am a child of the Savior of the world. I have a beautiful life. 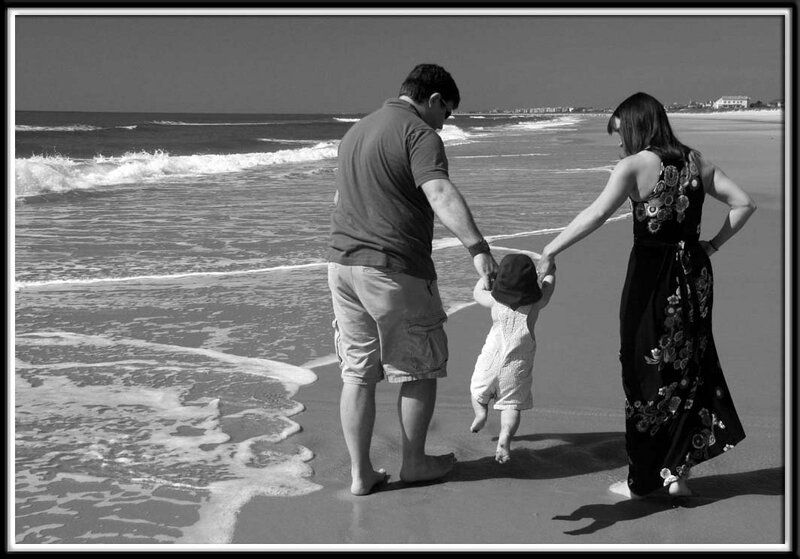 Malachi’s First Trip to the Beach! 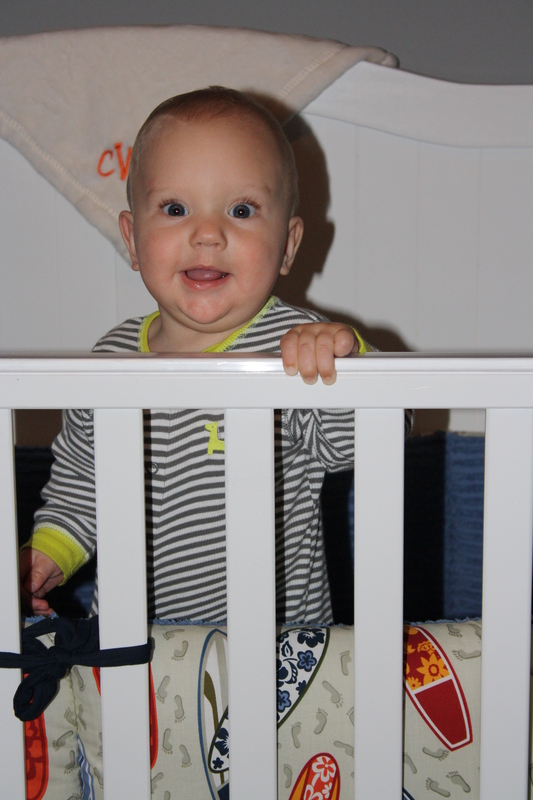 Happy 4 Months Malachi…A Lot Late!